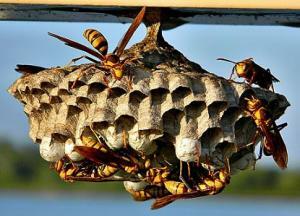 Yellow jackets, Hornets and Wasp control by Exopest. In North America yellow jacket or yellow-jacket is the same name for predatory wasps. All the members belongs to this genera are known as “wasps”. Yellow jackets have yellow and black mask bodies about 10mm to 16mm in length and their wings are as long as their bodies and may fold, when at rest. Wasps have thin waist and might be in greenish yellow and black colour. They live alone and don’t have colonies while yellow jackets have colonies. Yellow jackets are the aggressive defenders. They defend their colonies, and they are not really very quick to sting but their sting is very painful, each bug deliver multiple stings. They have the capability to sting repeatedly and by more stings victim has severe allergic reactions. How Exposet can help you with Yellow Jackets Control and Wasp Control ? Wasps and yellow jackets are predators of damaging insects. Treatment program should only begin with a proper inspection by wasp control professionals. Usually yellow jackets build their nests which are below ground, our inspection team will find out that nests eliminate it with the more effective control products. Exopest professionals use insecticides and latest products approved from Health Canada. Once nest is located and inactive, the rest can be removed and destroyed easily. Inspection – in which our team determine which thing is necessary and needed to provide an effective wasp control plan. Documentation – in this step our team complete its overall inspection and scheduled the services. Education – this step deals with the behaviour examination, diet and including habitat of wasps. Selection of control methods – such as traps, light modification, mechanical and insecticidal controls, physical removal. Sanitation – which means keep the area clean. Exopest Pest control services are just a call away for wasp control Vancouver, call us 604-760-1542.